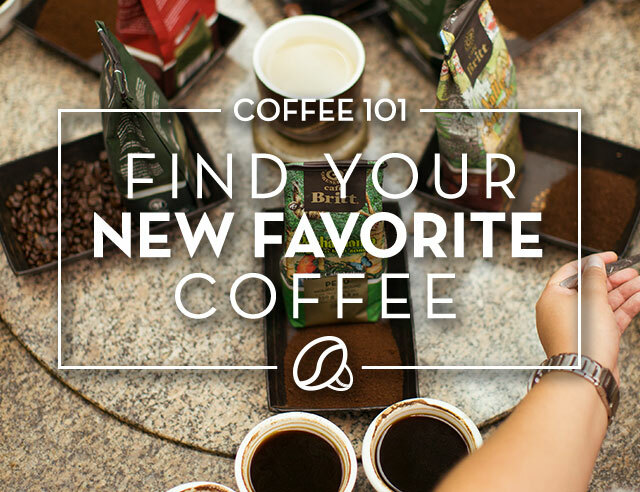 We coffee lovers are always on the lookout for the best coffee drinking experience and for the last ten years, coffee growers in Costa Rica have been pushing the implementation of a technique that produces an innovative, delicious, and rare brew. It’s called Honey Processed Coffee and it's taking the coffee world by storm. According to our founder, Steve Aronson, he first experimented with the honey processing technique in 1991 in our own backyard in Sabanilla. However, Honey Processed Coffee has only started to really gain popularity in the last ten years after a coffee buyer requested a “natural pulp” processing method that would leave the coffee bean slightly sticky, giving it a honey texture. 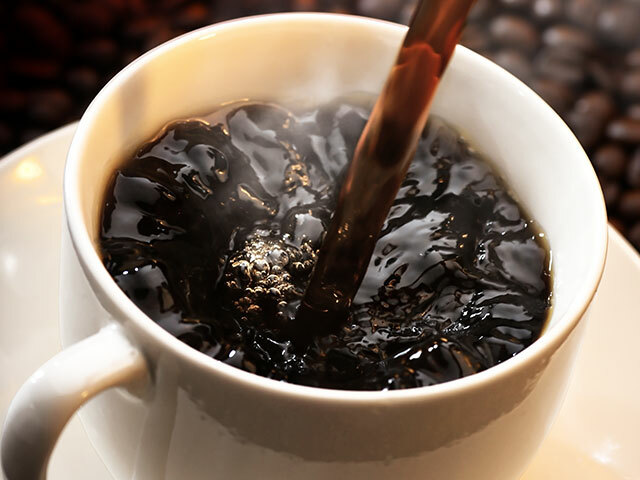 The name stuck and Honey Coffee is now all the rage among coffee connoisseurs. In order to understand what makes Honey Processed Coffee so delectable, we first need to understand the different parts of a coffee cherry. The anatomy of a coffee cherry is composed of five layers: the skin, the mucilage, the parchment, the chaff, and the seed. 1. The skin is the outermost layer and is usually removed within hours of being picked. 2. 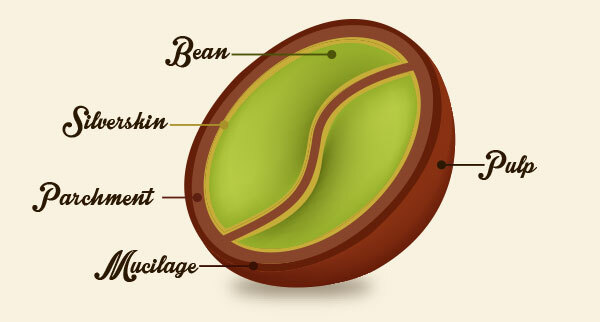 The mucilage is the fruity, syrupy coating that gives coffee much of its flavor. 3. Parchment is a protective layer in between the mucilage and the chaff. 4. Chaff is the thin layer that detaches from the bean during roasting. 5. The seed is the bean at the innermost part of the cherry. The difference between Honey Processed Coffee and other coffees is the amount of mucilage left on the bean. To make Honey Coffee, the skin and most of the pulp are removed from the bean, but the mucilage is left intact. The length of time the beans are left to dry combined with the amount of flesh left on the bean determines the type of Honey Processed coffee the bean will become. 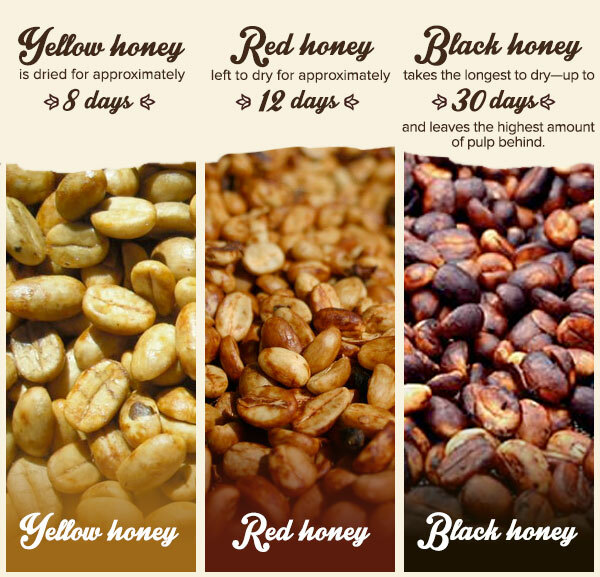 There are three main types of Honey Processed Coffee: red, yellow, and black. The process to prepare any type of Honey Processed coffee is extremely lengthy, but produces coffee with a truly distinct taste. In addition, In addition, Honey Processed beans are environmentally friendly, since no water is wasted when removing the mucilage from the beans. 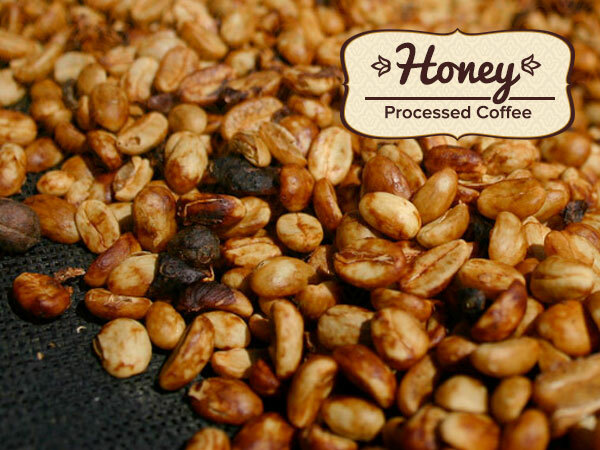 Preparing Honey Coffee is a labor-intensive process that results in a supremely complex and flavorful bean. If you’re in the mood for a savory, one-of-a-kind coffee experience, Honey Processed Coffee might just be the perfect brew for you.